This Kickstarter campaign will begin Tuesday March 20, 2018 and will run for a total of 35 days. 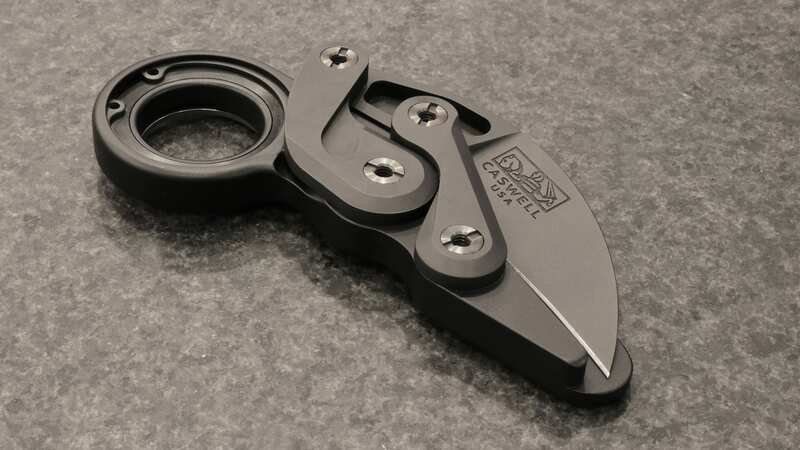 About the Knife: The “Morphing Karambit” is highly innovative karambit-style utility pocket knife designed to overcome issues associated with traditional folding knife designs that have been adapted to Karambit form. Seamless, Intuitive Blade Deployment. No need to remove fingers from the tool to allow blade to pass. User Safety is Enhancedbecause fingers do not cross the rotational path of a blade. This means the blade cannot close across the fingers like conventional designs, even in the event of lock failure. Convenient, Discrete“Zero-Profile” titanium pocket clip allows secure, deep-pocket carry without sacrificing accessibility. It does not create discomfort while the knife is grasped for use. It is much less likely to snag upon or damage objects encountered in close quarters compared with a conventional protruding pocket clip. Elegant Designincluding just FIVE principle parts, plus fasteners (and pocket clip). It is compact, rugged and optimized for use under demanding conditions. 100% MANUAL.MKV2 is NOT an automatic or assisted-opening knife! As such, it is generally legal to possess and carry anywhere a 2.5-inch locking folding knife is allowed. PREMIUM USA BUILD: The Kickstarter campaign is for a premium, USA-made, “no-compromise” build using only premium materials, high-precision processes and best-available finishes. Caswell Knives is excited to team with Millit Knives (Meridian, ID) for this superlative-quality MKV2 “Morphing Karambit” build! There will not be a follow-up MKV2 campaign! Any future USA build will be very limited and reflect RETAIL pricing! Knives will be completed and delivered in sequential “batches” and backers will receive rewards in order. This means early backers will receive their knives first, as completed. Delivery is projected to begin by October 2018.